Alan Pardew is ready to offer Jonjo Shelvey a way out of Newcastle United. Shelvey faces an uncertain future at St James’s Park under Rafa Benitez. The midfielder, signed for £12million in January, hardly featured in the latter weeks of last season. And there are no guarantees that Shelvey will be in Benitez’s preferred Championship starting XI. Shelvey knows he needs to be playing week in, week out next term if he is to have any chance of getting himself back into the England squad, having missed out on Euro 2016 despite featuring in the qualifying campaign. Pardew worked with the 24-year-old at Charlton Athletic and had been keen on a reunion at St James’s Park during his time as Newcastle manager. Benitez does not have to sell any of the club’s big names in this summer’s transfer window. But the 56-year-old could be willing to let Shelvey, one of United’s highest earners, leave the club. 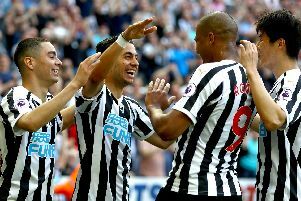 Shelvey’s wage, however, could be a problem for Palace, who are also interested in Newcastle goalkeeper Tim Krul, who is recovering from a ruptured anterior cruciate ligament. Krul, out of contract next year, hopes to be fit for the start of the season. And Palace are monitoring the Holland international’s situation, and fitness, at United, where he has been the No 1 for the past six seasons. The 28-year-old, however, could be persuaded to sign a new deal at St James’s Park.